You are here: Home » Potato Pizza! Bored of plain potatoes on your potato diet? Try potato pizza! When eating potatoes-only for 3-5 days, you can get by on the traditional roasted, baked, boiled, mashed presentations, however, after a week, it really becomes a chore to fix potatoes in a way that you get excited about eating them. Wait ’til you see what I just did! Last week I made a sweet potato flatbread. It dawned on me when eating it that this would make good sandwich bread post-hack. Today I made another batch, but I used regular white potatoes. The flatbread turned out even better! Nice and crunchy and easier to roll out flatter than the sweet potato recipe. Make your mashed potatoes however you like. During a potato hack, we like to use broth to moisten the mash instead of milk, I used a homemade vegetable broth. Immediately after mashing, start adding potato starch 1/4 cup at a time, adding more broth if it becomes too dry. The potato starch MUST be added while the potatoes are VERY HOT. Keep working the potato starch into the mash until it becomes stiff and doughy. I’m leaving out specific measurements because it’s that simple…just mix in potato starch until it forms a stiff dough. If this sounds hard, it’s not. You’ll quickly be able to judge “doughy” as without enough starch, the mashed potatoes are very sticky and crumbly. Break the dough into ping pong sized balls, then smash them out flat. I sprinkled some potato starch on the counter top and smashed the dough balls flat with the back of a plastic spatula, flipping and using my fingers until it was a very flat tortilla-like piece of dough. I’ll admit, this takes practice, and you mess up a few, but just re-roll it and try again, if I can do it, anyone can, lol. 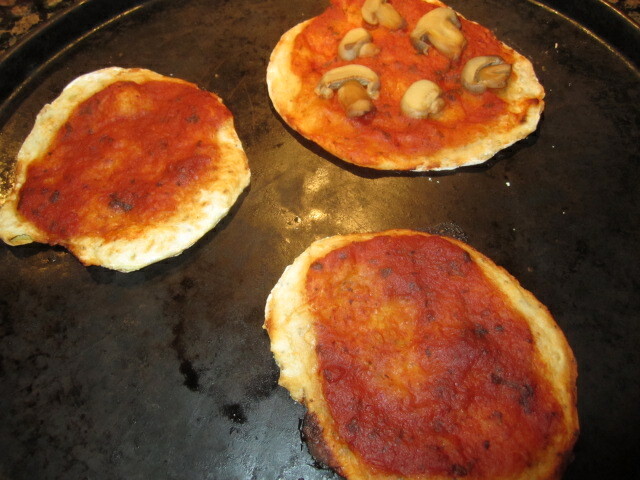 Once the flatbread is made, top each one with a spoonful of pizza sauce and bake in a hot (425 deg F) oven 15-20 minutes. They turned out perfect. This is probably my new go-to pizza crust! Made entirely of potatoes, so no worry about gluten or refined gluten-free flours. To keep this “potato hack” approved, I only topped them with 1 spoonful of pizza sauce, I promise I picked the mushrooms off that third piece! You could top these any way you like, and eat as many as you want (while potato hacking). 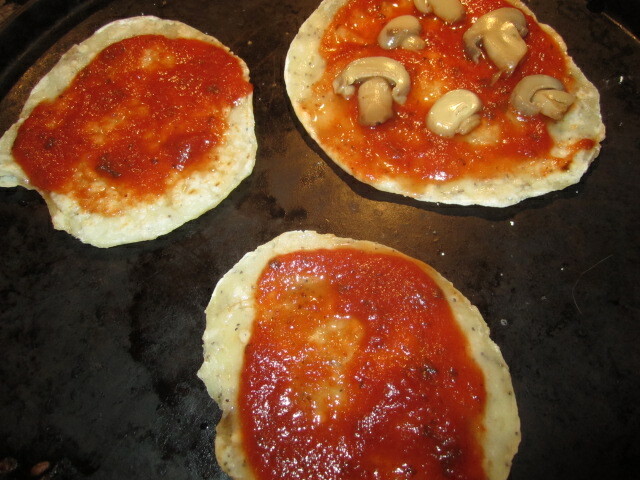 Otherwise, the possibilities are endless…mix some caraway, garlic, or onion in the dough and top however you like. 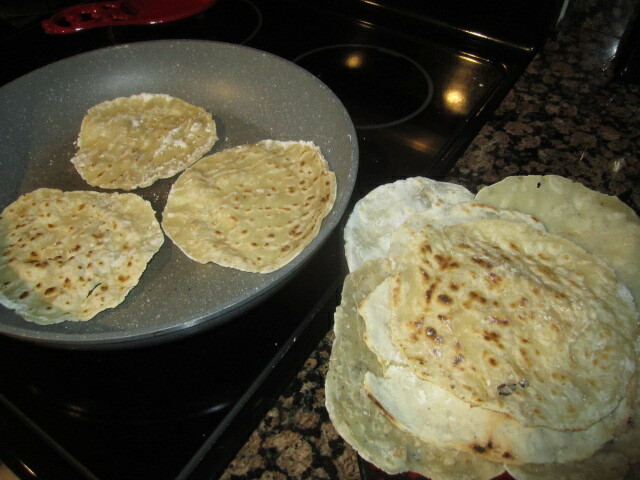 Or use the flatbreads for sandwich wraps.